We used to watch this entertaining film on TV when I was young. 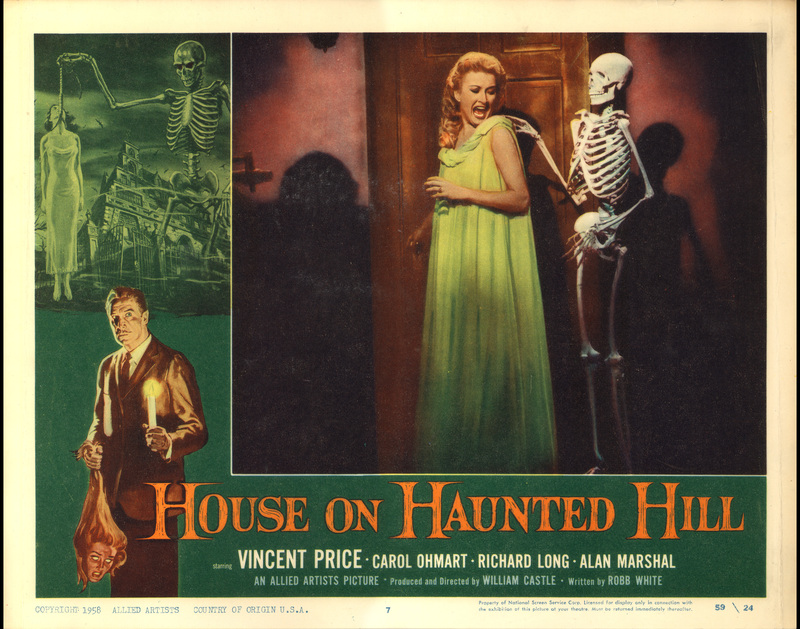 Vincent Price stars as an eccentric millionaire, who, along with his 4th wife, invite 5 people to their “haunted house” party. The seemingly random invitees are offered $10,000 each, if they are brave enough to spend the night in their creepy house. Crazy, strange & inexplicable (well, maybe explicable) stuff happens to each of the guests, but mainly it seems that Vincent Price just wants to scare his annoying wife to death, which he does, by using a full size marionette of a skeleton, getting her to fall into a convenient pool of acid he maintains in the basement. Great sound effects & music, by the way! Here’s the entire movie on YouTube!!! Watch the very beginning and end, for the fabulous intro and outro by Elisha Cook Jr.